"I'm in this trade to prove myself. I'm frightened of pushing things to the point where they might blow up - so that's what I go on doing, to prove I'm not frightened." Conscious as always that he is living on borrowed time, the ace "shadow executive" Quiller allows the London Bureau to throw him into a mission that seems already to be running out of control as one agent after another is reported missing or dead, out there in the field. On the French Riviera a defector from behind the Curtain crashlands his plane, uttering only one word before dying: "Kobra"; at Rome Airport a fuel tanker explodes as a dead man's car loses direction; in Cambodia a man sipping his coffee under the palm trees crashes back in his chair as a bullet shatters his skull - until there is only one executive left to carry the mission, and Quiller is ordered in. But Kobra - an international group of terrorists - counters every attempt to penetrate its operations: In Washington the scream of an ambulance siren is heard as Quiller's rendezvous is blown...in the jungle night along the Amazon a woman fires six shots, and each time shoots to kill...on a U.S. Air Force base a jetliner stands isolated as young girl is offered up as hostage...until Quiller sets the scene for his final gambit, in which he has only the ghost of a chance to get through as a time bomb ticks toward its detonation. 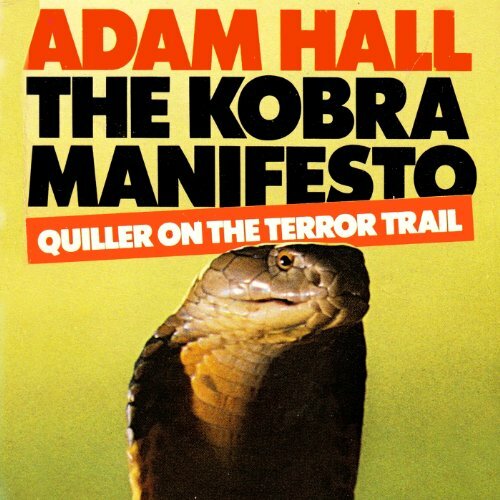 In his mission against the Kobra group, Quiller comes closer than ever to "pushing things to the point where they might blow up..." and Quiller fans old and new will happily go all the way with him. ©1976 Trevor Enterprises, Inc. (P)2013 Audible, Inc.